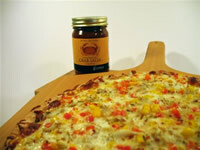 Top the pizza crust with Gunther's Crab Salsa. Evenly coat the crust with mozzarella cheese, crab meat, oregano flakes, red and yellow peppers. In a preheated 400 degree oven place the pizza directly on the oven rack (which has been placed on the middle setting) and bake for 13 to 16 minutes or until the cheese is bubbly and turning golden brown. Remove from oven, top with red pepper flakes and parmesan cheese. 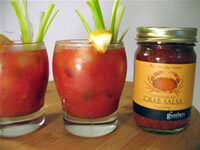 Divide the vodka, tomato juice and Gunther's Gourmet Crab Salsa in 2 eight oz tumblers. Mix well. 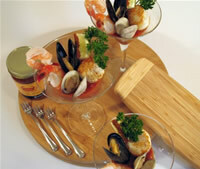 Garnish with celery sticks and lemon wedges which have been dipped in Old Bay. 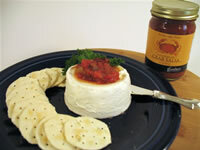 Place cream cheese on a serving platter or large plate. 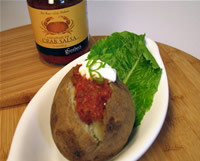 Bring to room temperature or microwave on high for 15 to 30 seconds until soft but not runny. Fan our crackers around the spread and serve. *Note - All ingredients can be bought pre cooked to save time or can be prepped out a day in advance, which makes assembling quick and easy. This will reduce cooking and clean up time and allow you to spend more time with family and friends. 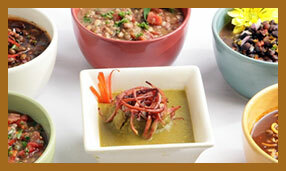 The seafood and meat are just suggestions; you can add or take out whatever you desire. Scallops - remove side muscle and season with kosher salt and pepper, saute over high heat almost all the way through, remove from heat and cool. Cut into bite size pieces and store in refrigerator. Can be made a day in advance. Shrimp - Peel and devein, season with kosher salt and pepper, saute over high heat until cooked almost all the way through, remove from heat and cool. Cut into bite size pieces and store in refrigerator. Can be made a day in advance. 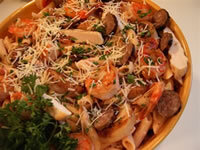 Sausage Links - (spicy or mild) Cook through, cool and cut length wise and then cut into half moons. Store in refrigerator. Can be made a day in advance. Chicken breast boneless/skinless - (approximately 7 to 8 ounces) Trim off any excess fat, season with kosher salt and pepper and grill or saute until cooked through. Chill, cut into strips and chill in refrigerator. Can be made a day in advance. Once all ingredients are prepped and ready, assembling is quite easy; *In a large stock pot, add heavy cream and Gunther.